Dan Booth and Jason Sweet are shy about their victory in Shirokov v. Dunlap, Grubb & Weaver et al (MAD 10-cv-12043), and it is understandable since this victory is bittersweet. Unfortunately, class action certification was denied a year ago, so the lawsuit continued as an individual plaintiff case all the way to the judgment: on 3/27/2014 Judge George O’Toole ordered the only remaining defendant DGW to pay $3,179.52, plus attorneys’ fees in the amount of $31,795, as well as $4,935.43 costs ($39,909.95 total). So, the victory is bitter because the initial goal — class action lawsuit that could change the copyright trolling landscape in the USA — was not achieved. Moneywise, the fees awarded are modest given the amount of work — the plaintiff was asking for $362,767. As explained by the judge, since the case lost its class action status, class action-range fees were not appropriate despite the actual effort. Yet the result is still sweet: victory is victory. The fee amount is not that low, and I believe the outcome will serve as deterrence to copyright law abusers. Kudos to Jason and Dan for pioneering a good fight! To the best of my knowledge, the only other class action lawsuit filed against copyright trolls was Barker v. Patrick Collins Inc. et al (KYWD 12-cv-00372). That lawsuit was dismissed because the plaintiff failed to convince the court that she had personal jurisdiction over the defendants. I’m sure that since the situation is different now (mostly because of Prenda’s downfall and since Lipscomb’s luck is also about to be exhausted), we will inevitably witness more class action lawsuits in the near future: I know that some lawfirms already think that the time is right and are actively looking for plaintiffs — copyright troll victims. 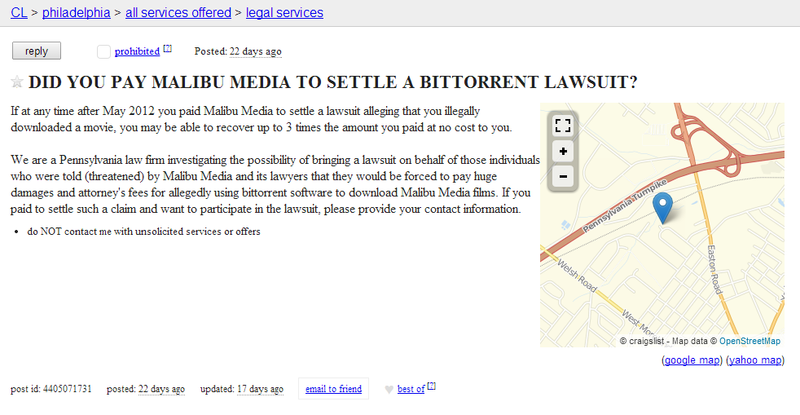 TorrentFreak: Accused Movie Pirate Wins Extortion Case Against Copyright Trolls by Ernesto. RT: Judge, siding with accused pirate, orders ‘copyright troll’ to pay up. TechDirt: Lawsuit Against First US Copyright Trolls For Extortion Ends In Victory by Mike Masnick. The first middle finger on US soil directed to the copyright extortion business enterprise. Kudos to Booth&Sweet, Shirokov and for you for the update. In England, the director of Guardaley lost his license to practice law, was fined into bankruptcy and sent to prison. Guardaley then morphed into IPP of Germany and continues the tsunami of lawsuits against Americans. The judges are more than happy to fast track these claims of infringement based on a German’s say so with no address, phone number, expertise, while being immune to US Law.